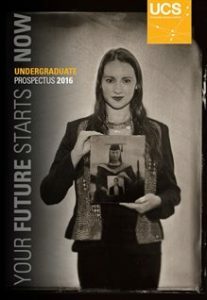 For the 2016 undergraduate prospectus UCS chose to experiment with a different style of photography for the front cover. Photographer John Brewer was commissioned to produce the artwork. 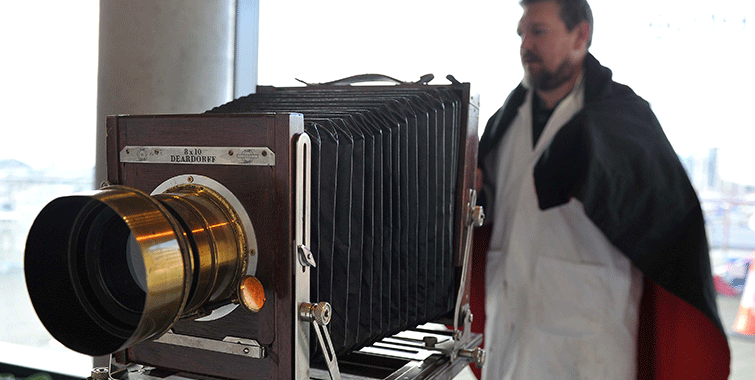 John is experienced in the photographic process, wetplate collodion, which created the interesting, unique style used for the prospectus front cover. The photographs were taken and developed instantly on the day of the photo shoot. The idea behind the design of the front cover was to show the progression of a student from the beginning of their studies, looking towards the future. It took three stages of photos – one showing the student, then them graduating, and finally them in their chosen career. The initial concept for the prospectus design was based around ‘reflection’ with the idea that when students are embarking on their journey at university they are at a time of reflecting on their lives.